Capture attention. Drive action. Get measurable results. As the name suggests, action campaigns are used to encourage a specific action—usually in the short term. When executed right, action campaigns are ideal for new product or service launches, recruitment efforts, special events or promotions, and other time-sensitive business goals. Considering running an action campaign? Curious if it's the right approach for your marketing? 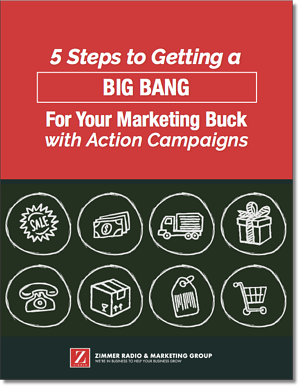 Check out our eBook, 5 Steps to Getting a Big Bang For Your Marketing Buck with Action Campaigns. Complete the form to download the PDF for free.